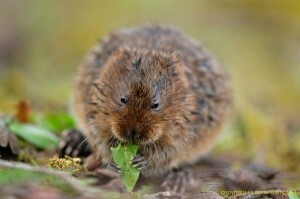 The water vole is the largest of the UK voles and sometimes mistaken for a rat. Though it is indeed Ratty from Wind in the Willows it is not a rat at all and is a herbivore with a rounder nose than a rat, a chubbier, more friendly, face, short furry ears and with a tail covered in hair. Water voles live in burrows along the banks of slow-moving canals, streams, burns and even ditches. They are unfortunately short-lived creatures, seldom living beyond a year in the wild, but can make up for this by having up to five litters of up to eight young. They lead busy lives and eat up to 80% of their body weight in grass every day. Water Voles like to sit and eat in the same place, so piles of nibbled grass and stems are often found near their burrows. They are territorial during the breeding period, and mark their territories with piles of green cigar-shaped droppings. The water vole is one of our most threatened native mammals, having undergone a dramatic decline, particularly during the latter part of the twentieth century. The population loss is estimated to be at least 90%. Its rate of decline over the past 30 years has been the fastest of any UK mammal. The reasons for this include habitat degradation and fragmentation, and also predation by American mink. They have many native predators but, unlike the mink, none of these seem to threaten the survival of the water vole. 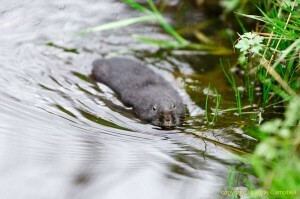 Mink are waterside animals and the smaller female mink is capable of following the voles into their burrows. Since otters, as larger predators, usually displace mink, there are signs in some areas where there are otters of a slight recovery of water vole numbers. Sometimes the habitat of these lovely creatures is destroyed when ditches and waterways are cleaned out by mechanical diggers. From time to time police wildlife crime officers become involved in carrying out an investigation to establish whether or not this has been done despite the knowledge on the operator or landowner’s part of the presence of water voles. Thankfully these incidents are uncommon. While the water vole has been fully protected in England and Wales since 2008, in Scotland it is only the place of shelter of the water vole, or disturbance of the animal while it is using that place of shelter, that are protected. We just have to hope that in Scotland everyone has read Wind in the Willows and would not want to intentionally or recklessly kill or injure Ratty.